An arbor or pergola is not only an investment in your home but a great way to take advantage of those sunny Omaha days in the shade. There is nothing “prefab” about our arbors; we custom build each one. Our objective is to create a strong yet elegant structure. It’s your choice, how to mix function and style for your new arbor or roof. Arbors and pergolas will cut down on the temperature both outside and inside your home. This is beneficial to everyone, but especially to those who have direct sun on the rear of their house. Arbors and pergolas are a great way to create that outdoor resort feeling in your own backyard. Accent them with benches, lights, planters, etc. 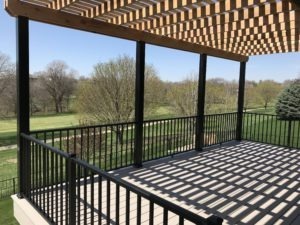 Decks, Decks & More Decks will help you come up with a design that will truly create an oasis, right in your back yard!